Bob “Dr. 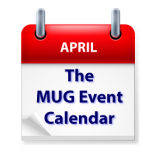 Mac” LeVitus’ visit to an Ohio group tops this week’s MUG Event Calendar. Safari will be the topic of discussion at a California group, Photos will be covered at a Maine group, and your Digital Legacy will be the topic of discussion at an Arizona group. South Jersey Apple User Group – Mac Applications: How have they changed?